We are peasant women of the world that in the course of these 20 years of Via Campesina have worked tenaciously to build a universal, broadly based democratic, politically and socially engaged movement in the defense of peasant agriculture, food sovereignty and the struggle for the land, territories justice, equality and the dignity of peasant women and men. We are women from various continents and cultures, with common histories and struggles for life, our emancipation and that of our peoples, coupled with the ethical and political imperative of protecting the right to food, defending peasant agriculture, biodiversity, our natural resources and the struggling to end violence in every form, sharpened before this capitalist and patriarchal economical system. This is clearly established in the conclusions of our III International Conference in Bangalore. 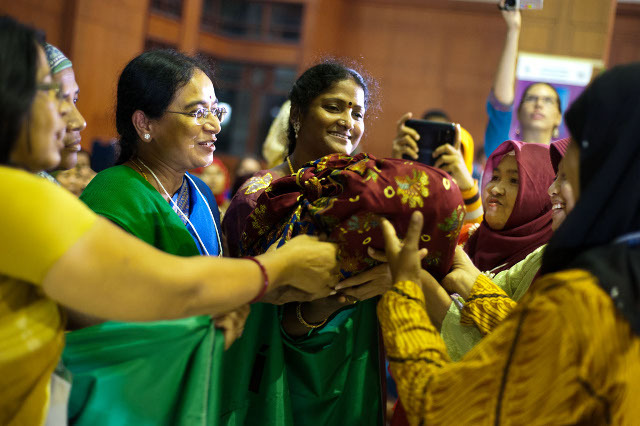 Via Campesina, through a structural change, guarantees that peasant women and men in the movement share responsibilities equally seeking to strengthen open and democratic processes in our international structure. We deliver this Manifesto and its political statement, to the women of the world and to the VI Via Campesina International Conference, as input for the deliberations, for the work, the action and the struggles that we continue to develop around the world. Going forward in the unity and the action for the full incorporation of women on equal terms in the political, economic, social and cultural aspects, eliminating the discrimination that affects us in our daily lives, in agricultural areas and indigenous communities, is a task of all of us, both men and women. In these two decades of life, struggle and hope of Via Campesina, we women have had a key role in pushing forward the political/organizational strategies for the future, fighting day by day for the defense of Mother Earth, our territories, against the looting, the devastation, the death and oppression caused by entrepreneurial and colonial capitalism. In these two decades deep changes in the life conditions of rural women around the world were made, capitalist invasion in the fields and the appropriation of food systems by the multinational companies have led millions of peasants to incorporate themselves into paid labor, causing severe migration processes, forced displacements and land losses, precipitating many changes inside families where women must assume the greatest responsibilities for the economic support of the family. The emigration of women from the countryside is closely related to the impoverishment and the levels of violence that women and girls suffer, and this situation is more severe because of the discrimination they also suffer in the recipient countries. Despite this situation women that have migrated have became important to the support of their families since in many cases remittances constitute the principal income of their families. Confronting this reality is one of the fundamental objectives of struggle of women and the entire Via Campesina. Our biggest step towards ending injustice in the world is taken by breaking the poverty cycle and granting the rightful place that we peasants have to provide and guarantee sufficient and balanced food for the peoples, recognizing the central role of women in food production. However, tragically, far from decreasing, poverty has increased in recent years in most countries. Studies of United Nations agencies and the World Bank, indicate that this situation is worsening and the gap of wealth distribution has expanded, presenting to the agricultural sectors the grim picture of increased poverty, where women continue to suffer the more dramatic effects. Ending these shameful inequalities of class, gender and ethnicity that affect millions of women worldwide and eliminating the scourge of hunger and violence is a constant struggle that governments and parliaments of the world need to take into account when legislating and approving laws searching to guarantee the comprehensive development of dignified lives of rural women and their communities in the whole world. “To us, the peasant and indigenous women, the land is more than a means of production. It is a space of life, culture, identity, an emotional and spiritual environment. Because of that, it’s not a commodity, but a fundamental component of life, which is accessed by rights that are inalienable and only allocated through property and access systems defined by each people or nation”. Equal access to land for men and women is a fundamental component of overcoming poverty and discrimination. The assumption that fair access to land can be achieved through market mechanisms and individual property is far from representing the views and aspirations of indigenous and peasant women. We women demand a comprehensive Agrarian Reform to redistribute land with our full participation and integration throughout the process, ensuring not only access to land, but to all the instruments and mechanisms on an equal footing, with a just appreciation of our productive and reproductive work, where rural areas guarantee a dignified and fair life for us. To protect and enhance our ways of doing and improving agriculture, our seeds, markets, foods, using our knowledge, our science and our technology. To encourage and generate appropriate public policies and programs for our cultures and ways of life, with resources that make viable peasant production, ensuring food sovereignty and the rights of peasants men and women with social justice. In this way the access to land for us rests on a comprehensive Agrarian Reform that promotes the development of a management model that places at the center of the process the social function of land and the peasants’ and the indigenous peoples’ practices of land use and production, ensuring the human needs to food as a fundamental right for life. Our struggle and action for Food Sovereignty has given us women the opportunity to make visible our historical participation in the development of the food systems in the world and the role we have played since the invention of agriculture, in collection and propagation of the seeds, in the protection and preservation of biodiversity and genetic resources, placing us as primary emotional, ethical and social pillars. Under the slogan “the food is not an issue of market, but of sovereignty”, we have been defining our sovereign rights to decide and organize the distribution, exchange and consumption of food in quantity and quality according to our possibilities and needs, prioritizing solidarity, cultural, social, health and welfare factors for the Jakarta, Indonesia, 7th of June 2013 benefit of our families and our rural and indigenous communities. We can affirm that we have taken up the fight and the exercise of Food Sovereignty. In order to reach this objective we have worked hard “to summon all our knowledge, to recover our seeds, multiplying them, care for them, swap them and let them walk again, grow and multiply by our fields without hindrance or aggression”. This has put us in an opposition to intellectual property, certification rules, GMOs and Pesticides. Women’s work and power within families and in movements must be recognized, including the economic and productive value of seed selection and food production by women, which requires personal and collective processes, of us and our partners. The economic contribution that our work represents to agriculture, the household economy and macro economic indicators of the nations must be appreciated. We are convinced that the most significant and revolutionary proposal of Via Campesina has been to initiate Food Sovereignty as distinct from the food security proposals of the FAO and the Governments, seeking a solution to hunger through food security, understood as the availability of food and the financial capacity to purchase, leaves food in the hands of the market forces that are resulting in a global scourge of hunger, and suffering for a billion human beings in the world. Strengthening mechanisms for participation of rural women in the formulation of public policy proposals and programs both internally and externally, to ensure resources for development, both locally and globally and the management of these, expanding access education and technology. Confronting patriarchy means recognizing privileges and myths of male superiority, re-socialize and sensitize leaders studying the history of women, in order to evaluate it. Until now, women have taken the lead, but it requires equal involvement to move forward from declarations to concrete practices. The organized peasant women are convinced that the future is promising, as there is no possibility of moving back in the progress and triumphs achieved, and even less so in the minds of women. Fighting for the “sovereignty of the land, the territory and the body” saying no to violence against women in all its forms. Because of this and inspired by the debates of the women of Latin America and their process of constructing a political proposal for the construction of a base for “Popular Peasant Feminism” our Assembly has taken on the challenge to also expand this debate within the organizations of La Via Campesina at an international level.